Snowflake Friends MOOSE Plush Red Penguin Scarf Antlers Stocking Cap Hat 12"
Beautiful Paris Eiffel Tower. This is used and shows minor wear. This does not take away from the beauty of this piece. Mirror Compact. This will not last long at all. Yellow Chick with color yellow with pink trim shirt Fluffy Plush Stuffed Toy. Dan Dee Jelly Bean Scented 15" Plush Bunny Rabbit New with Tags! 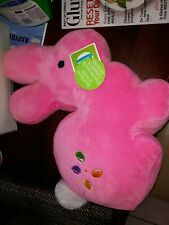 Dan Dee Jelly Bean Scented 15" Plush Bunny Rabbit New with Tags!. Condition is New. Shipped with USPS First Class Package. Large Soft Shiny Floppy Yellow Bunny Rabbit Plush Stuffed Animal Laying Down 18"
Frog Plush Stuffed Animal W /Red Heart "Love", W/ Croack Noise When Press-16"
Sad Sam Honey. Gray Puppy Dog. Red Heart Bows. THIS IS A MOOSE WEARING A RED & WHITE STRIPED KNIT SCARF. HE HAS A STICKY CLOSURE AT HIS TUMMY SO THAT. EXCELLENT CONDITION AND JUST AS CUTE AS A BUTTON! OR BE PULLED TOGETHER IN A MORE UPRIGHT POSITION. Cute & Cool Law Tigers Plush. SITTING 8" TALL. THE FIRST BEAR HAS A BASEBALL STYLE HAT, THE SECOND IS AN ANGEL WITH WINGS AND HAIR BOW, AND THIRD HAS A TOP HAT AND BOW TIE. ALL ARE DECORATED WITH STARS AND STRIPES ON THEIR ACCESSORIES AS WELL AS ON THE BOX. Fiber Optic Christmas Tree Table Top Display Santa Rooftop Chimney Scene 21"
Fiber Optic. Christmas Tree. A wonderful Christmas Table top Display. Tabletop Christmas Display. About 22" from horn to tail. From Circus Circus in Las Vegas. Good condition. Snowman Stuffed Animal Plush Toy 18" W/ Scarf & Hat "Be A Star Foundation"